This is another example of finding three or four ingredients that you have available and, very simply, making a skillet. Spice blends are awesome to have on hand because you get balanced and developed flavors without having to think too hard or measure and prepare. 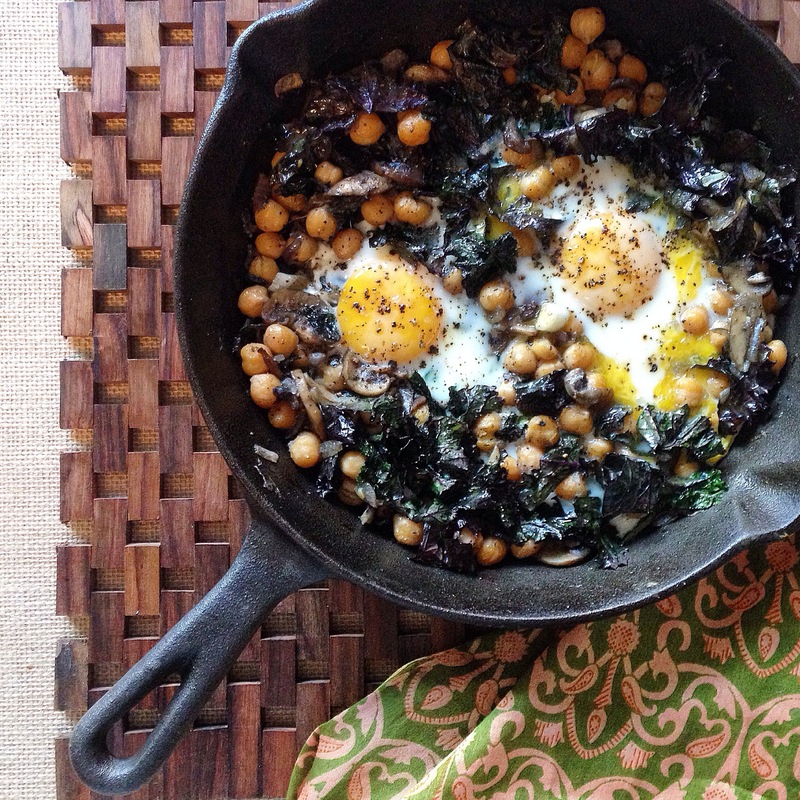 This one has a generous sprinkle of Madras curry spice blend and it is perfect with the chickpeas and kale. This vegetarian dish provides proteins, complex carbohydrates and many vitamins and minerals and takes about 15 minutes to make. Simple, easy, filling and delicious. Saute mushrooms over medium-low heat in a large spoonful of coconut oil. When the mushrooms are about half-way through to soft, add the onions, salt and pepper and chickpeas. Stir gently to avoid mashing the chickpeas. Sprinkle the Madras blend over the skillet and stir gently again. When the onions are soft and the mushrooms are cooked, stir in the kale. Turning everything over constantly, to mix and cook evenly, for a minute or two. Remove from heat. Make wells for the eggs. Crack and gently poor the eggs into the wells and sprinkle generously with salt and pepper. Put the skillet into the oven and watch it closely. Remove from the oven once the egg whites are cooked but the yolks are still runny. Happy Holidays and please support your local, small businesses this Christmas.